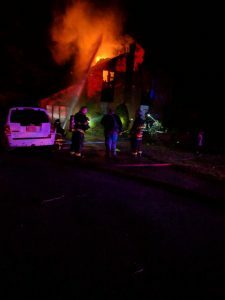 During the early morning hours on October 19th, 2018 the members of the GTFD were dispatched to a reported computer on fire in a residence on South Street. Upon arrival of 95-2, he reported visible smoke and flames from a second floor window, all occupants were out of the residence. A second alarm was immediately requested and the incident was upgraded to a working structure fire assignment. The fire was reported to be under control approximately 1.5 hours later with all mutual aid resources being returned shortly thereafter. Thank you to everyone who assisted as this incident.